T-Mobile subscribers might have a lot of subs in their future. The innovative carrier announced today that it has partnered with a few more companies that will provide freebies to T-Mobile subscribers every Tuesday. 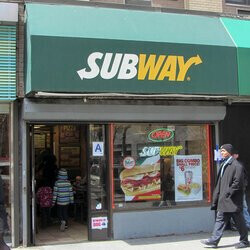 The new partners include Subway restaurants, Buffalo Wild Wings, Shell and PetSmart. Next Tuesday, T-Mobile subscribers can tap on the T-Mobile Tuesday app to score a free 6-inch oven roasted chicken sub from Subway, along with a free Lyft ride (up to $15) and a free movie rental from VUDU. All T-Mobile subscribers have to do is tap on the app each week to earn freebies, and have a shot at winning epic prizes like free Shell gas and a new car to put it in. Subway and Buffalo Wild Wings are also joining the regular weekly rotation that consists of Wendy's, Lyft and VUDU. Since the launch of T-Mobile Tuesday, the app has been in the top ten on both the Apple App Store and the Google Play Store. Speaking about T-Mobile, today the wireless operator officially launches T-Mobile One. For $70 a month for the first line (with auto pay) and $50 for the second line, the new service provides consumers with unlimited talk, text and 4G LTE data. Also unlimited is mobile hotspot access, and video. The latter is streamed at 480p (DVD quality). For an extra $25 per month, T-Mobile One Plus offers unlimited HD video streaming, 4G LTE unlimited mobile hotspot use, and unlimited data in 140+ countries at twice the normal speed. T-Mobile subscribers this coming Tuesday will be able to enjoy a sub while binge watching their favorite show from the back of a Lyft car, all without having to pay an additional penny. But for how long will these freebies last? Nice way to bait people in, T-Mobile! They don't bait people, their prices are awesome, I don't need a single freebie to stay with T-mo. They thank people, and I'm sure it's good advertising for all of their partners so it's a win win. Agreed. T-Mobile is the best carrier when it comes to unlimited data and jump on demand is rediculous. Put 0 down for my blue coral note 7 and got the 256gb card. They let me jump as many times as i want if half the device is paid off. Good to go. I dunno, I didn't hesitate a bit when cricket had the 100$ + 35$ per line to switch, 5 lines, surely enjoying my 160$ monthly bill (no takes, two lines unlimited with unlimited hotspot at 4G LTE) with a sweet 675$ credit, that was a win-win, what good is loyalty when there's better options out there? but yes I do like t-mobile, back when I was a college freshman they were the only ones that didn't require me to have a deposit, and rocked a Nokia c7, will always thank them for that. Glad to see Tmo working to make the Tuesday giveaway better. I knew once Domino's backed out of their deal that Tmo would work to make things better. I personally don't think they're done. It's a work in progress, only being in the game for about 3-4 months now. I believe the goal is to have a little something that all of their customers can enjoy. That would be perfect. Especially since my Subway is right beside Wendy's.